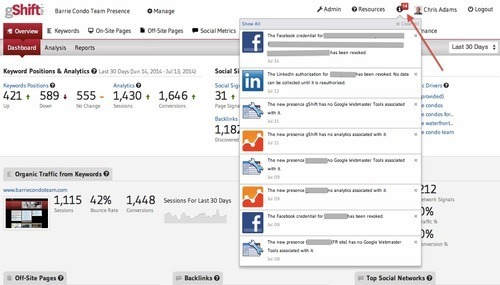 New Clients - if you have recently set-up a new client and missed authorizing a data connection such as Google Analytics, Google Webmaster Tools, or any Social Platform, then we will alert you via notifications within 48 hours. It will appear as a red number beside the “i” (information) icon. You can choose to ignore the notifications by clicking the “x”. Or you can click “show more” and see all of your recent or past notifications. Google Analytics or Google Webmaster Tools - if there have been changes to your email account or another issue that has caused your Authorization connection to be dropped, then we will immediately alert you to this issue so that it can be re-authorized. We back-collect your data so don’t be worried about any missing data. Social Platforms - most of the social platforms have a time limit for a data authorization. For example, Facebook requires all marketers to re-authorize every 60 days. This is done for security and privacy protection. Therefore, if we see your token coming up for renewal or it has past that time and has become inactive, we will alert you. Agency users that are managing multiple clients with possible multiple social accounts will get multiple alerts for each social account and/or client. You can click on the alert and it will direct you to the appropriate authorization management page. Alert me to when this new web page ranks in the top 50 in Google. Alert me to when my client’s website drops out of the top 20 for X keyword. Alert me when Google Webmaster Tools shows a 404 error for any of my pages or any other GWT alert.